This book provides many ideas on how to create a belly dance costume based on the American Tribal Style of belly dance. While describing the look popularized by Fat Chance Belly Dance, the book offers a variety of ideas that should enable a troupe to create its own distinctive look rather than looking like it merely mimicked the original. The book is also a helpful resource for dancers who enjoy folkloric costuming. It includes a guide to ethnic jewelry, which can be immensely helpful to dancers who would like to know the ethnic origins of pieces in their collections, and a section on ethnic garments provides ideas for historical re-enactment events such as Renaissance Faires and Society for Creative Anachronism events. This 96-page book provides instructions in creating belly dance costumes that are compatible with the American Tribal Style of belly dance and its derivatives that originated in the San Francisco Bay Area in California. Rather than adhering strictly to the costume design that Fat Chance Belly Dance made famous, this book looks at the pre-Fat Chance look that flourished in the decade before Fat Chance arose. In doing so, it offers a wider range of ideas for dancers who love the earthy look but want to create their own distinctive costume that doesn't strictly mimic Fat Chance. As an introduction to the style, the book touches on a variety of costume themes. It provides an ethnic and historical perspective on the ethnic jewelry and textiles favored by tribal-style dancers. It then talks about the different costume components (head wear, choli & bra, hip wraps, skirts, pants, and one-piece garments) that are used to achieve the tribal look. For each, it describes how it can be incorporated into the overall tribal motif, and offers instructions on how to make it. The instructions for making the garments are not very detailed, so you would need some solid sewing experience in order to interpret the instructions and make an actual garment. The book contains many line drawings to show how each garment would be worn as part of a total tribal ensemble, including instructions on how to wrap a turban. At the end, it provides a small amount of information about the facial tattoos, bindis, and henna. Several appendices cover additional useful topics, including how to do appliqué, how to make tassels, how to do embroidery with shisha mirrors, how to care for tribal costumes, and recommendations on how to do your own research. Dancers who love to do historical re-enactment through Society for Creative Anachronism, Renaissance Faires, or similar organizations will find that this book provides an excellent starting point for helping their costume research even if they want to re-create a specific look from a particular time and culture rather than the fusion that makes up tribal costuming. The information about ethnic jewelry and textiles helps clarify the region and ethnic context for each item. Several ethnic garments suitable for use in such events are described with information about which culture they come from, and the bibliography at the end lists a large number of books to provide a starting point for doing one's own historical clothing research. You want to create a costume based on an earthy aesthetic rather than on a sparkly aesthetic. You embrace either American Tribal Style or Improvised Tribal Style of belly dance. You want to create an original, distinctive look for your troupe rather than simply imitating the Fat Chance costume design. You can't imagine yourself wearing a costume without sequins or glass beads. You have absolutely no interest in learning about ethnic textiles, ethnic jewelry, or Middle Eastern clothing. You have no interest in learning how to create costumes for Tribal-style belly dancing. The section on historical textiles and jewelry provides valuable background information about each and information on which region each came from. Now I understand my own collection much better! The overview of the different garments used in tribal costumes with recommendations on how to bring them together for a finished look provides guidance in how to create a costume with an original look that remains close to the Tribal aesthetic. The book is very credible. Dawn herself has been using tribal-style costuming for many years, and the tips she offers on considering how the garment will be used (whether it will be close to fire, worn in hot weather, etc.) are clearly the voice of experience. This is someone who truly understands garb and re-enactment events. The varied lists of books that Dawn suggests provide valuable resources, whether you need sewing and pattern-making education, historical research, jewelry information, henna help, or other costume-related information. For any dancer interested in doing her own research, this book will point to the right direction for additional sources. If you're new to historical re-enactment, the costuming tips for surviving such events will prove to be very valuable. The drawings illustrating how different garments could be used together contain nice detail and shading in showing the line and drape of the garments. Although the book provides instructions on how to make most garments, these instructions are not very detailed. Only someone with solid sewing skill, patience, and willingness to adventure into drafting her own patterns will be able to work on the basis of these instructions alone. Drawings illustrating the pattern pieces needed to make ethnic garments are not drawn to scale. I wish that Dawn would have included some photos of herself or other tribal dancers to illustrate how the ensemble looks when it all comes together. Although her drawings conveyed the idea, some photos would have greatly added to the value and credibility of the book. The spiral binding, although keeping the book in an affordable price range, makes it inconvenient to store on the bookshelf, especially if that shelf is holding several additional spiral-bound books. If you want one resource that will teach you about how to create a costume for Tribal-style belly dance, this is the one. 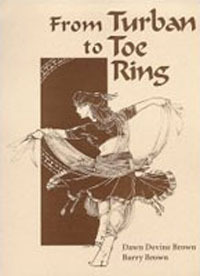 Of all the belly dance books and videos I have seen on Tribal costuming, From Turban to Toe Ring does the best job of addressing the popular textiles, jewelry, and garments used in this costuming style. Because the book was published before the explosion of popularity of Tribal Fusion, its advice is based on the Tribal tastes of the 1990's. I actually think this is acceptable, because a dancer needs to understand the foundation of the dance style before she can build a fusion look based on it. The advice in this book provides that foundation with respect to costuming. I have known Dawn for many years, and consider her to be a friend. She mentions me briefly on the "Acknowledgements" page of this book.